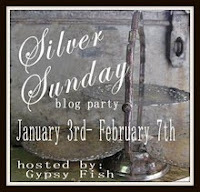 EDITED 1/30/2010: Ive just run upon this blog and discovered that she has a Silver Sunday party. Silver?! You know I'm there. Count me in. Run over there and see all of the other beautiful silver pieces everyone else is showcasing. I'm envious of her collection, and can't believe what she just found among her family treasures! I've been working away at widdling down the boxes. I can finally see over them, which is a major accomplishment if I do say so myself. There aren't any rooms fully finished, so I can't show you much right now, and I still haven't found my brackets for the drapery rods so I still don't have any window treatments hung. Where are those darned things? If you see them, will you please let me know. Do you remember my obsession with all things tarnished silver? In this move I decided to open all of my boxes of silver to see how much I really do have. I'll just tell ya that even I was surprised. 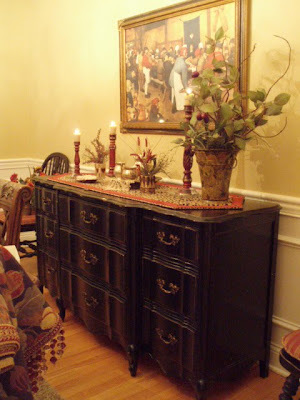 I vowed to display as much of it as I could, and since I now have a formal dining room, I figure I'll start in there. Not that my dining room is too formal by any means, as you'll see, but you know what I mean - a dining room that sets all by itself instead of being part of another room. Here's a little peek at what I've been working on. Hmmm, I see I'm also missing the globes and candles for those green candlestick holders. No clue why they weren't together in the box. Now where could they be? I LOVE my silver. This is just the beginning of putting it out, as I've noticed pieces of it seem to be migrating to all of the other rooms. I'm fighting putting some on the mantle, but I think I'll lose that battle in the end. Just wanted to give you a peek. Tomorrow night I'm going to tell you about what I found today, right down the road from the house. It was such a pleasant surprise for both me and hubby. I'm headed up to the workroom for the night to build my new worktable. I'll take good pics so I can do a tutorial on how to build one for yourself. I call it my 6 foot x 10 foot ironing board, because essentially, that's what it is. "Please let Polly find her drapery rod brackets tonight, repeat, repeat................."
I just love it, too too pretty. I love your silver, too! 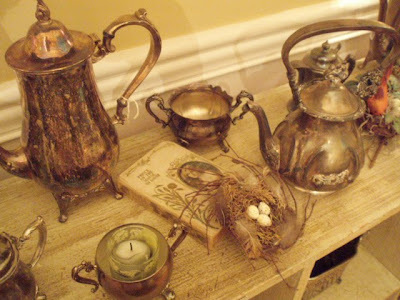 I have a few pieces of tarnished silver and love it! Yours look really neat displayed that way. You have a beautiful silver collection, Polly. Things look like they are really coming together. Good luck finding your rods!! Very pretty! Love all the red touches. Your silver is facinating! I may need to start a silver collection soon. Thanks for sharing! I'll bet those globes and candleholders are in the same box as the drapery rods! You are moving right along, Polly! It probably feels good to get some of your things out and about in the new house. It will be feeling like home before you know it. I love all of your tarnished silver. It looks great. I do hope you find your rods. Good luck. this looks so beautiful! How nice to have dining room now to display every thing. I'm thinking maybe you should set a bigger board on top of your square hutch...with the squares...so that it would look larger and hold more SILVER!!! 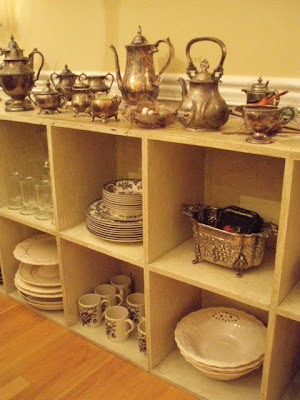 You have a fabulous silver collection and you have it displayed perfectly!! Can't wait to see your work table. Snap girl! Didn't you just move like a couple days ago?!?! It looks FABULOUS already! I'm lovin' it...can't wait to see more! Thank you for so many nice comments. Still can't find those darned brackets, so I'm headed out to JCP to see if I can find some more. I NEED to get my drapery hung. It's an OCD thing. Can anyone tell me how to delete the spam posts in my comments? I don't have anywhere that says 'delete'. Wow, Polly, no wonder you needed 3 moving trucks. Musta been the silver! 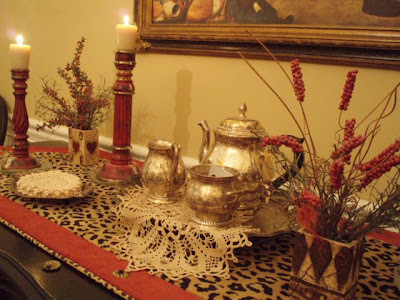 :) Beautiful vignettes! Re: removing comments, make sure you've signed in and click on your post title. There should be a little garbage can with each post you can simply click to delete. Well, still hope you find your brackets. Your silver collection is beautiful. I found the cutest little silverplate creamer and a small silver compote at GW today. Because of you and a couple of others I follow, I am having "silver envy", so am on the search. Your dining room looks really good. I would be doing my workroom first. Looking forward to seeing what you do. And also what you found down the street. Wow, stunning, I love your collection! My friend, I'm so happy to hear that you got moved! I have had to go back a couple of posts to catch up since our last visit! Sounds like you had quite the moving experience! Eeeks...moving is never fun!!! But...I absolutely adore what I've seen of your new home so far!!! 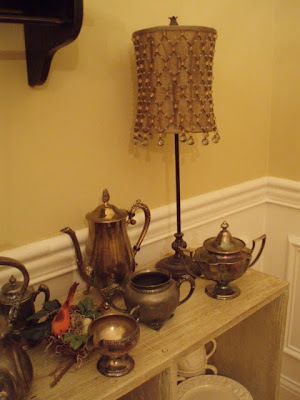 Your dining room is gorgeous and I love, love, LOVE your collection of silver! Girl, I know that I drooled all over this keyboard while I was looking at it! hehe! Oh, that sounded so crude...sorry! Seriously though, you do have some really pretty pieces! I'm really looking forward to seeing more of your collection...and more of your new home!!! I'm not very good at waiting so pleassse hurry (wink)! Well my friend...I know that you're a busy little bee right now. Don't work too hard...wait, work hard and post!!! Hehe! Thank you for sharing your collection with us today for Silver Sunday...what a sweet treat!!! PS...sending good vibes your way so that you'll find that drapery hardware!!! 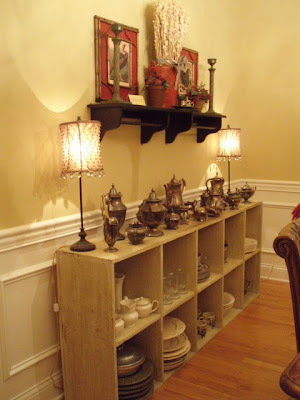 You have so many beautiful pieces and the perfect setting to display them. I hope you find all the pieces! What a wonderful way to display all your silver. I like that alot! Happy SS! So glad you found the party...and what a contributor you're going to be....wow you've got a baotload of silver! Just beautiful! Oh, can I just browse through all your beautiful silver? I promise not to touch....not much anyway! Love it all! I love your collection...wow so many beautiful pieces! Hard to pick a favorite it is all so pretty! You know you are a girl after my heart with all that beautiful silver. It all looks gorgeous in that new dining room!! Looks like you are wasting no time getting everything in order. I love your dining room. Comin' back to see more. Thanks for sharing. It's so exciting to discover things that were packed away. Shopping without money! Hi, you have some beautiful pieces, I cant wait to see more...love surprises too. Love love love that tarnished silver! Love your silver collection.....I also have a bit of an obsession with silver! Happy SS! So glad you joined in! it looks wonderful! i love your collection. Your dining room is gorgeous. I love the open shelving. That alone was fab, but the silver on top was beautiful. I'll be back. Fantastic collection! I love that you appreciate the vintage patina too. Wow! That is a fantastic silver collection...what fun I would have polishing it...well, some of it! Thanks for sharing.